I’m in the process of rebranding. I’m very excited about all of my goals and plans and can’t wait to share all of my changes with you. I’m currently going back over my old patterns, making new samples in fresh yarns, taking new photos, and adding borders and fun details to my patterns. I also have a few things in the works and I am so anxious to get them finished and out into the world. I haven’t been very active for a while and I can’t wait to connect with the crochet and fiber community. I’m also hoping to take up knitting and tatting soon. I’ll share here how that adventure goes. Two of my blanket patterns, Rippling Diamonds and Flying Kites, create a pattern by leaving strategically place chain spaces (basically filet crochet style). Rippling Diamonds has a beautiful almost-diamond wavy ripple pattern. Flying Kites has diamonds inside of rectangles. The (I think!) awesome and exciting part about these two patterns is they include instructions how to make these blankets in ANY size you could possibly want. I even included the math equation to figure out how to make them in any gauge, hook, or yarn of your choice. I am available to help or check your math if needed, of course. I think these are fun and super easy. If you can chain and double crochet, you can make these! I’ve switched gears and focus recently and have started cranking out patterns for animal hats. 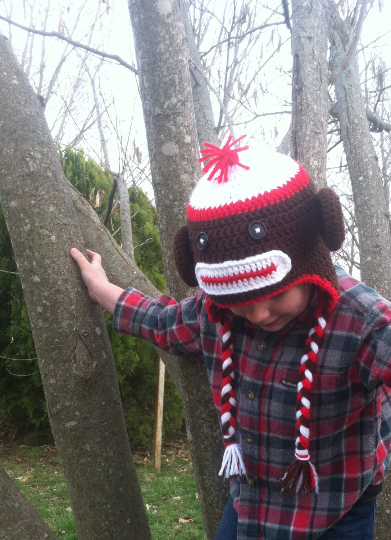 My first is the classic sock monkey hat. I think it turned out pretty cute. My son really loves it. I’ve also got a fox and a hippo in the works, so stay tuned! You can purchase this in my Etsy Shop. 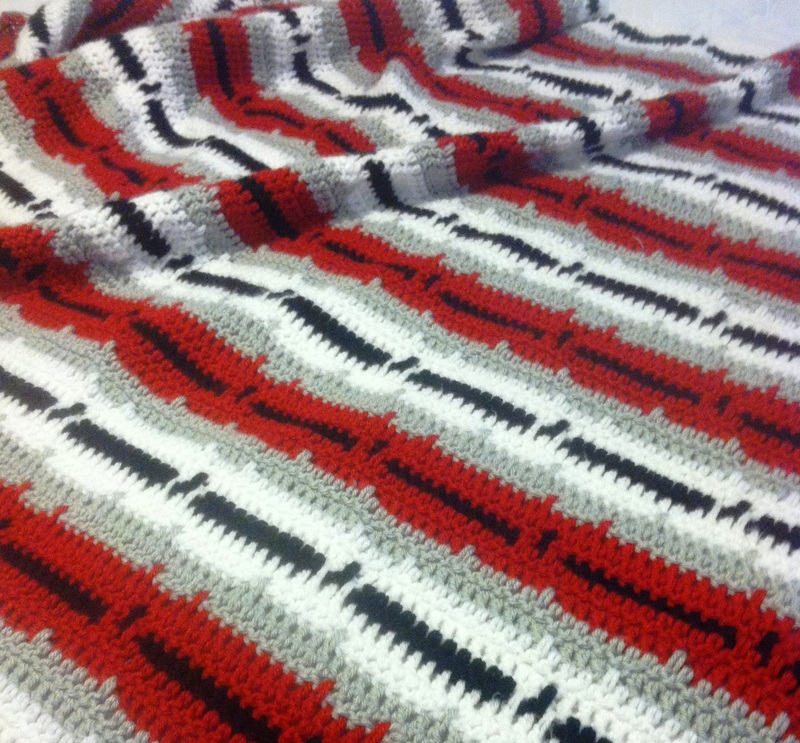 My newest pattern is my Shooting Arrows Afghan. I’m really excited about this one. I’ve never seen a blanket with this pattern before and I spent a lot of time getting it to work. I hope you like it as much as I do. You can purchase the pattern in my Etsy shop. I recently received a special request: a scarf for my 6 year old nephew. I had never made a kid sized scarf before. 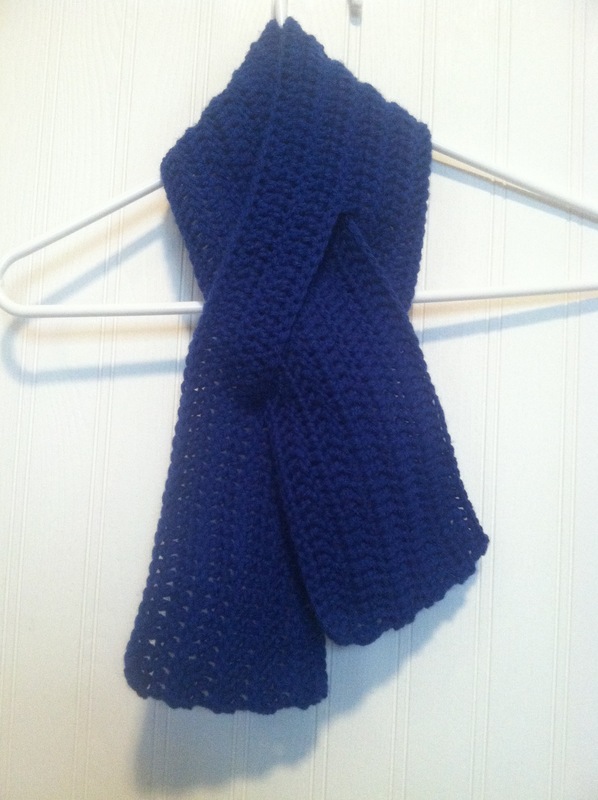 After thinking about what to do for a bit, I decided on a few standards I wanted this scarf to meet. I wanted it to be something he could put on himself, that would stay on, and that wouldn’t be too tight around his neck. And this is what I came up with. It is SO easy and works up really fast. And it’s super cute. 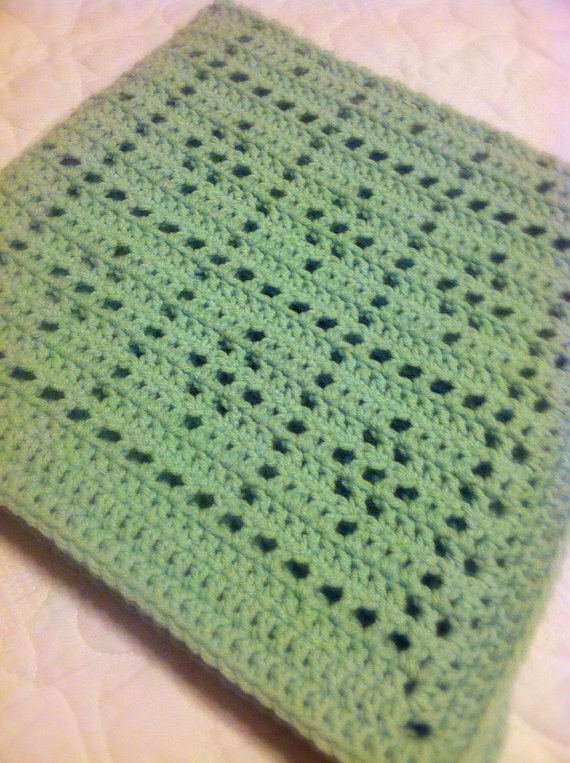 I used worsted weight yarn (Impeccable available at Michael’s) and a size J hook for a gauge of 6 stitches per 2 inches. 1. Chainless sc 108, OR ch 109, sc in 2nd ch from hook and in each st across. 2. Ch 3, turn, dc in each st across. 3. Repeat step 2, three more times. 4. Ch 3, turn, dc 20, ch 16 and skip 16 st, dc into the 17th st and finish row by dc in each st across. 5. Repeat step 2, four times. Be sure to dc into the ch and not into the large ch space. This will keep your stitches spread evenly and prevent bunching. 6. Ch 1, turn, sc in each st across. 7. Tie off and weave in ends. 8. Thread long end of scarf through the 16 ch hole. My newest pattern added to my Etsy and Ravelry shops is the Subtle Diamonds Blanket. 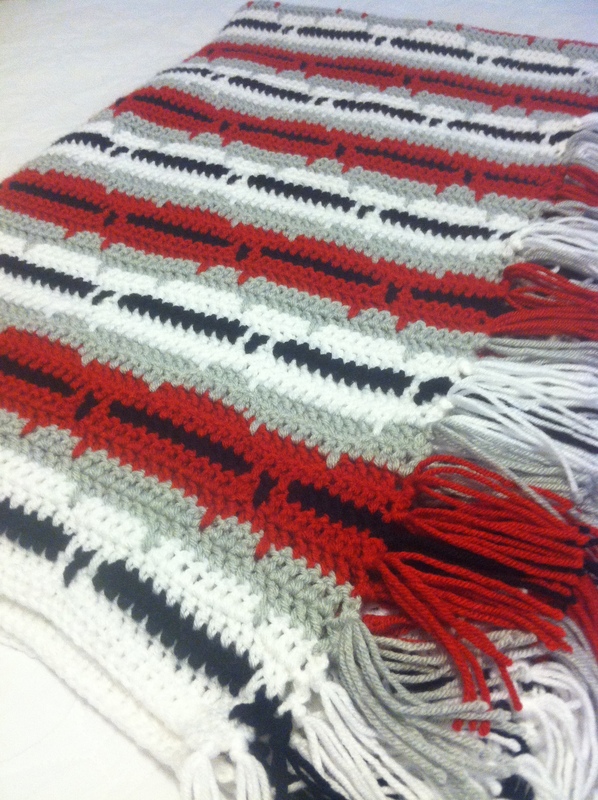 The only skills you will need to create this blanket is chaining and double crochet! The pattern includes a photo tutorial for creating the spike stitch and also instructions for how to create this blanket in any size and with any gauge you would like. There is a color chart included as well, so you can see the pattern visually, as well as the written instructions. This pattern is quite special to me and has a bit of a history. My family’s home burned down in 1996, when I was in 4th grade. Unfortunately, we lost everything including, most tragically to us, our childhood things and all our photos. Last year my brother mentioned how he would love if I recreated the blanket our mother crocheted him when he was a baby, but since we lost our pictures it took us a long time to find an image. My mother came across one this summer and I started working on the pattern and crocheting it immediately. I finished it just in time for Christmas. I am very pleased to have such a special blanket pattern in my shop, and I hope you will appreciate it as well. You can purchase this pattern on my Etsy site as well as the Ravelry site. Stitch Gauge: How to measure it, why it’s important, and more! One of the first things you’ll need to learn about as a crocheter is stitch gauge, especially if you have moved on from simple beginner projects to trying to read and replicate patterns. If you are trying to make anything a specific size, especially wearable items like hats, booties or clothing, you NEED to know your gauge. Stitch gauge is the number of stitches per inch. It will vary greatly due to hook size, yarn weight, and from person to person. It can even vary for yourself depending on what mood you’re in! The tighter you crochet, the smaller the stitches, and the greater number of stitches per inch; the looser you crochet, the bigger the stitches, and the fewer number of stitches per inch. To measure gauge, you will need to make a sample swatch. You’ve probably seen these swatches at the store where you bought your yarn. This is kind of annoying and I can understand why you would want to skip it and just jump right into your project. However, spending the extra 5-10 minutes to make sure you have the correct gauge can prevent you from spending hours working on something that will be unusable when you’re finished, which would be tragic! Start by creating a chain approximately 4-5 inches long. Then double crochet across, chain up, double crochet across, and repeat until you’ve crochet 5 or 6 rows. DO NOT STRETCH YOUR SWATCH!!! Next you will measure, in the center of your swatch, how many stitches you have per two inches. Be sure to measure from the same part of the first stitch, to the same part of the last stitch. This is your stitch gauge! Just for an example, with Caron Simply Soft yarn and a J hook, I typically have 6 stitches per 2 inches. 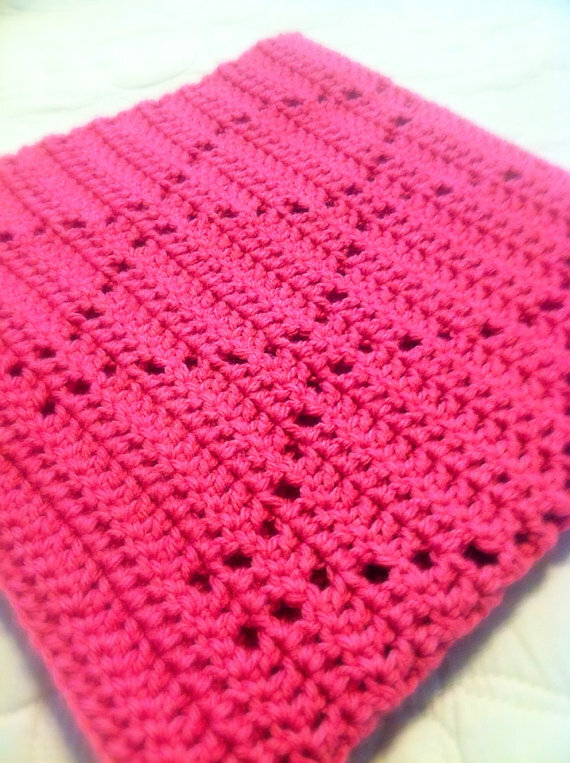 NOTE: There is a handy little crochet and knitting measuring tool called a stitch check. These are wonderful tools, but not totally necessary. I often use a measuring tape app on my iPad just for convenience. You can usually find a stitch check anywhere you would buy yarn. If you’re working with a pattern and the stitch gauge doesn’t match with yours, you can do two things: change your hook or change your yarn. Typically you will have picked out and bought the yarn you want to use for your project by the time you are checking your gauge, so changing your hook is the more likely option. If you have MORE stitches per inch than your pattern, try a BIGGER hook or BIGGER yarn. If you have FEWER stitches per inch than your pattern, try a SMALLER hook or SMALLER yarn. Keep making gauge swatches until you get as close as possible to the gauge in the pattern. Once you’ve been crocheting a while, you won’t have to do this as much, at least not with your go-to yarns, because you will have done it enough to know what your personal gauge is with each hook. Something else you can do is adjust a pattern to fit your gauge. Maybe you want to make a blanket a certain size, but with super bulky yarn. Or maybe you don’t have a full set of hooks to try to adjust it. All you have to do is… math! Crochet patterns are all about math. Say you have a pattern for a blanket which calls for a gauge of 8 stitches per 2 inches and a total of 144 stitches across and you would like to keep the same dimensions, but your stitch gauge with the yarn and hook you want to use is 6 stitches per 2 inches. Divide the 8 stitches by the 2 inches of the pattern’s gauge to get 4 stitches per 1 inch. Divide the 144 stitches by 4 to get 36 inches (which should be the measurement of the blanket across, if the measurements are included in the pattern). Now, divide your 6 stitches by the 2 inches to get 3 stitches per 1 inch. Multiply the 36 inches by 3 stitches per inch and you will get 108 stitches, which is how many stitches you should make per row to achieve a blanket the same size as the pattern.